Damien Hirst has intensified his career-long fascination with the beauty, fragility and symbolism of butterflies to create a spectacular and multi-allusive evocation of mortality. More than that of any contemporary artist, and in a modern lineage that includes the work of Andy Warhol and Francis Bacon, the art of Damien Hirst confronts the balances between life and death, vanity and transience, value and worth, faith and existential alienation with a visceral and terrifying immediacy. Hirst’s choices of media, his innovations within them and the sheer scale on which he works, are integral to the philosophical depth and empathetic charge of his art; and to this end, Hirst has always pioneered in his work the uses, aesthetics and allegorical meanings of science and technology, as well as refining a highly sophisticated engagement with craft and technique. In total ‘The Souls’ is made up of 4 butterflies, in 80 different colourways, each one in an edition of 15. Vibrant with hue, the finished effect of each print is that of a resonant tension between the stillness of death and the trembling, iridescent life that the individual butterflies convey. ‘The Souls’ is therefore quintessentially Hirstian, combining the impact of visual spectacle with a powerfully eloquent confluence of medium and visual language. “This comes from an idea to fill the gallery with butterflies, an idea that I’ve had before. When I think of “The Souls” I think of Judgment Day and “Jacob’s ladder”. Many souls work better than one, so to hang them … and (to) use all the available space is a great way of doing it theologically”. 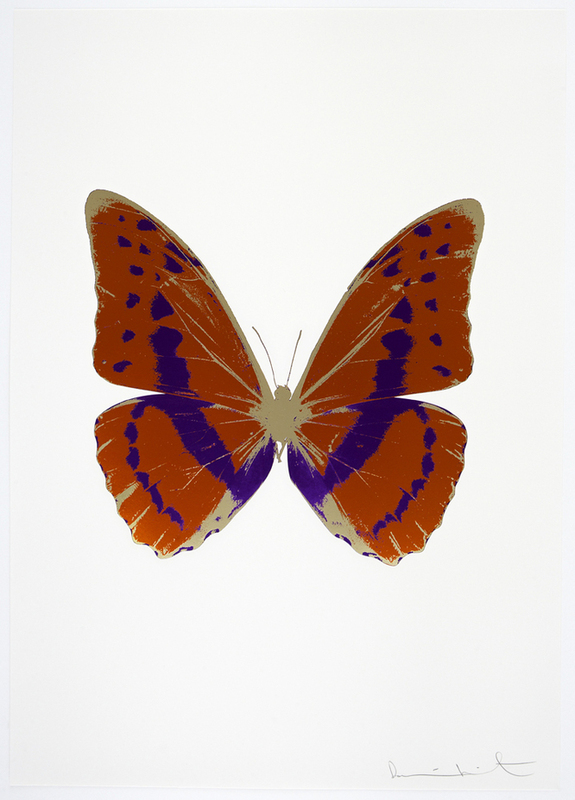 Hirst’s fascination with butterflies derives in large part from the way in which these beautiful insects embody both the beauty and the impermanence of life, becoming symbols of faith and mortality. Of ‘The Souls’ he has said: “I love butterflies because when they are dead they look alive. The foilblock makes the butterflies have a feel similar to the actual butterflies in the way that they reflect the light. After ‘The Dead’ I had to do the butterflies because you can’t have one without the other”. Like Warhol and Bacon, Hirst is in many ways, primarily, a great religious artist. His work – as further evidenced by ‘The Souls’ – deals directly with the timeless and endlessly renewing predicament of faith and belief in the face of mortality. In this, ‘The Souls’ can also be seen to connect directly to the allegories of mortality to be found throughout the history of art. As the butterfly itself is a traditional symbol of the soul, and of the soul’s residence on Earth prior to transmigration to an Afterlife, so ‘The Souls’ surrounds the viewer – chapel-like – with an art which is as meditational and contemplative as it is aesthetically forceful.